Swedish firm Bornstein Lyckefors Architects won the WAN Adaptive Reuse Award 2016 with their project for Torsby Finnskogscentrum in Värmland, Sweden. Swedish firm Bornstein Lyckefors Architects won the WAN Adaptive Reuse Award 2016 with their project for Torsby Finnskogscentrum in Värmland, Sweden. An unassuming, old school building in the forest has been revived as a museum in memory of the Finnish migrants who settled in this zone in the 17th century. Migration is a constituent part of the history of people, and the Torsby Finnskogscentrum in Sweden's Värmland region is a fine testimonial to this. It is, in fact, the end result of the local council's desire to create a memorial to local history, echoing the new, present-day migration movements. So Swedish architecture firm Bornstein Lyckefors Architects was commissioned to convert an old unused school building in Lekvattnet - the heart of the region known as the “old Finn territory”. This is because farmers from Finland settled here in the early 1600s and practised their trademark "slash and burn" style of cultivating grain in the middle of the forest. The architects, therefore, had two challenges to address - on the one hand, to change the use of the original building and on the other to communicate the mission of the centre from the outside in. So they decided to craft an outer skin. 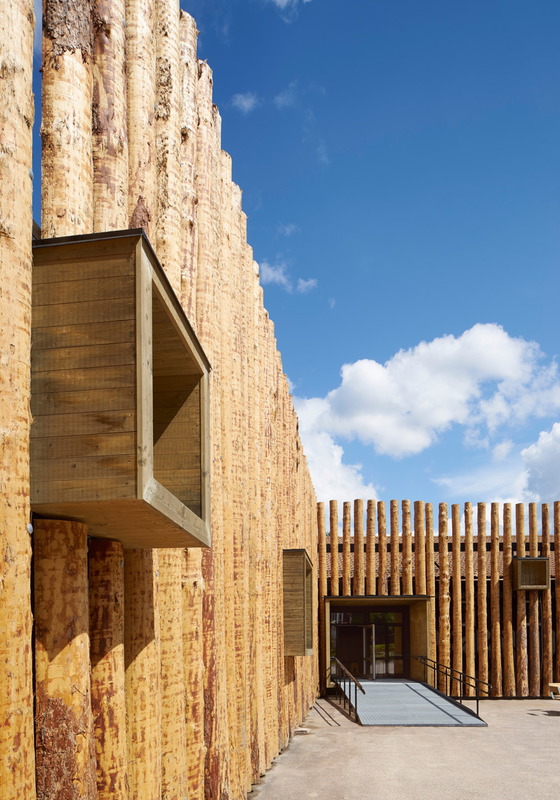 This visually striking wooden palisade, forms a detached facade for the museum structure behind it, which can continue to expand as funds are raised. The palisade consists of 300 logs that has been cut down in the woods surrounding the museum. They are decorticated, untreated, cleaved in half, and mounted on a rack surrounding the building. The interiors of the repurposed building transmit the memory of the site with references to the way the Finnish migrants lived, revisited in a contemporary style, helped by the bright colours of the fit-out. The design approach of Bornstein Lyckefors Architects integrates the old with the new in an innovative and dynamic whole, whose expressive strength on a low budget convinced the jury of the WAN Adaptive Reuse Award who declared Torsby Finnskogscentrum the 2016 winner. The reincarnation of a chapel as a cultural centre.